Promising a new, more production vehicle-derived NASCAR Sprint Cup stock car for the 2013 season, Dodge initially teased media and Mopar followers with images last week. 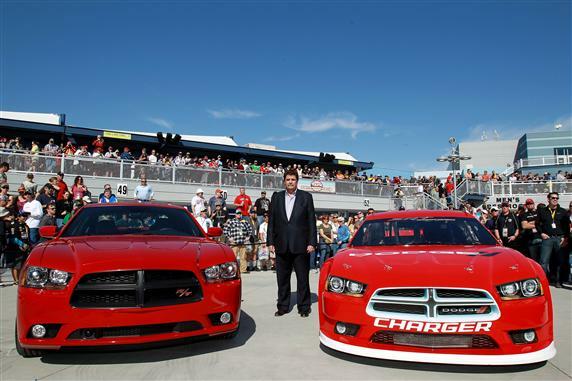 At Las Vegas Motor Speedway, the 2013 Dodge Charger stock car premiered at the race track's neon garage. Made evident with a side-to-side photo, the appearance of the NASCAR-bound 2013 Dodge Charger integrates the proportions and shaping of the production car. The 2013 NASCAR Sprint Cup technical rules have been written to allow auto manufacturers to marry brand identity in the most profound way in decades. President and CEO of SRT Motorsports Ralph Gilles responded to the increased freedoms NASCAR gave to the 2013 Dodge Charger race car saying, "NASCAR provided the manufacturers with basic specifications, but offered encouragement to venture beyond the look of the current race car." The reaffirmation of Dodge's involvement in the NASCAR Sprint Cup Series in 2013 is an important halfway mark for motorsport-geared Mopar fans. The second half of the 2013 season plans consist of what team(s) will run the Dodge brand. Shortly after the 2012 Daytona 500, the Chrysler's brand most loyal supporter Penske Racing announced a switch to Ford next season leaving Dodge without a main team. Dodge's top team for the past several seasons in NASCAR Sprint Cup racing, Penske Racing will (ironically) have a hand in developing the 2013 car. It's fair to assume we should expect an announcement later this year that a large team will adopt the Dodge Charger body in 2013. Speculations would lead to Earnhardt Ganassi Racing as a likely candidate but other NASCAR Sprint Cup team possibilities could include Richard Petty Motorsports and the BK Racing team (formerly Team Red Bull).